Einstein is only 14 inches tall. Pint-sized pinto Einstein is a smart-looking wee pony who may well claim the record as the world's smallest foal. Einstein was born on Friday at Tiz Miniature Horse Farm in Barnstead, New Hampshire. He stands just 35.5cm (14 inches) tall and weight 2.72kg (six pounds). He shows no signs of dwarfism, nor is he is premature foal, having been born three days after his due date. Everything is in perfect proportion. The Guinness Book of Records lists the smallest foal at nine pounds. His owners are now Rachel Wagner and Charles Cantrell, of Bellingham, Washington, who learnt about the foal from the breeders Judy and Larry Smith. The Smiths met Wagner and Chantell during breakfast at a local eatery on the day of Einstein's birth and told them about the foal. The couple, who had previously bought a horse from the Smiths, wanted to see him and fell instantly in love with the wee fellow. Cantrell bought him as a gift for his wife. But, for now, Einstein has some growing to do and the company of his mum to enjoy. 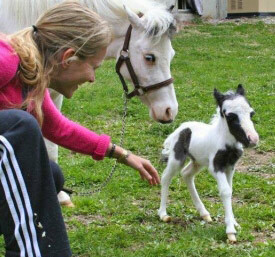 The world's smallest horse is Thumbelina, a dwarf miniature who stands 44.5cm at the withers and weighs around 26kg. She has travelled the United States raising funds for children's charities.